Attorney Daveta Williams dedicates her practice of law to defending criminal cases and ensuring that every case is resolved diligently and with zeal. She truly believes that everyone deserves justice. Attorney Williams is native to Fort Lauderdale, Florida. In 2010, she relocated to Tallahassee, Florida where she obtained dual Bachelor of Science degrees in both Criminal Justice and Psychology at the Florida State University. In 2014, Attorney Williams relocated to the greater Orlando area to pursue her legal education at the Florida A&M University (“FAMU”), College of Law. While attending FAMU College of Law, Attorney Williams became involved with the Phi Alpha Delta Law Fraternity. This allowed her to follow her philanthropic passion, serving as Community Service Chair. Her career passion to defend all led to multiple internships in personal injury, juvenile, and criminal law. 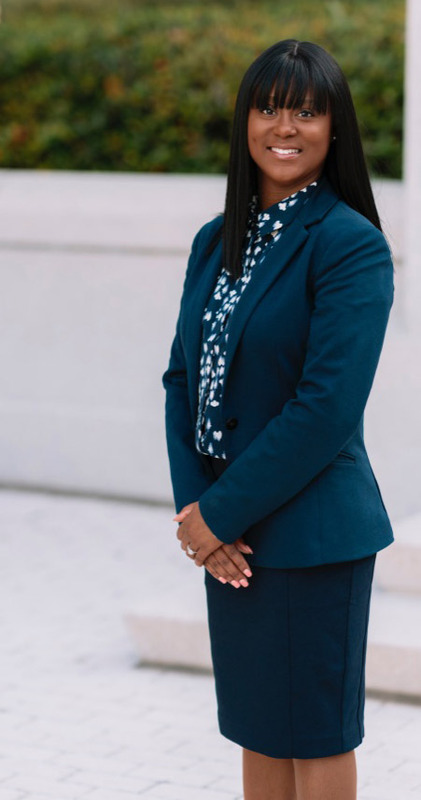 After law school, Attorney Daveta Williams served as a lawyer with the Office of the Public Defender of the Ninth Judicial Circuit of Florida. She has proven results in investigating and researching factual basis of cases, arguing motions, conducting depositions, and litigation of juvenile, misdemeanor, and felony cases. Attorney Williams handled a large caseload while negotiating with prosecutors and communicating with clients in preparation for trial.